Each of the neighborhoods served by Touching Miami with Love has a unique history. Read on to hear the history of two target communities of Overtown and West Homestead. 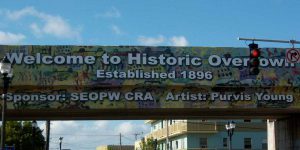 Overtown is one of the oldest neighborhoods in the city of Miami, dating back to 1890 when it was designated as a segregated living area within the Miami city limits for blacks working on Henry Flagler’s railroad. Blacks were not allowed to live within the white community; therefore the land west of the railroad tracks, within the city limits of Miami, was designated as “Colored Town”. . .and was later called Overtown. The area grew and developed into a vibrant community, and Blacks became owners of businesses and thereby helped establish a viable economic community. In 1960, Overtown reached its peak in population and though isolated by racial segregation, Overtown was culturally and economically vibrant with a diverse mix of 318 businesses. During this same time a controversial program is taking place in major cities across the country. . . Urban Renewal. In the early 1960s, the well-being of the Overtown neighborhood was subordinated to the expansion of Miami’s port and the city’s economic development. By 1965 much of Overtown had been razed for highway construction and “urban renewal.“ Interstate 95 a ten lane expressway and state highway 836 were both constructed directly through the heart of Overtown during the 1960s. Through imminent domain, the expressway displaced 20,000 people. West Homestead is a largely unnamed neighborhood on the western edge of the city of Homestead opposite the more affluent East Homestead. The community is connected by West Homestead K-8. The City of Homestead, the second oldest city in Miami-Dade County, celebrated its 100th Year Anniversary on 2013. The South Dade area opened to homesteaders in 1898. At the time the only way in and out of the area was through a path called the “Homesteaders Trail.” In 1904, Henry Flagler decided to extend the railroad from Miami to Key West. Farmers in the area were able to transport their fruits and vegetables to Miami and other parts of the state. 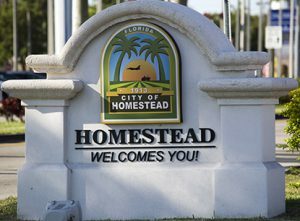 Many of the workers who helped build the railroad stayed in the area and founded the City of Homestead in 1913. In 1926, Mother Nature unleashed her fury with a major hurricane, destroying Flagler’s Overseas Railway. In 1945 another severe hurricane struck and demolished the World War II airfield at what is now Homestead Air Reserve Base. Then, almost 50 years later, Hurricane Andrew blew through deep South Miami-Dade, leaving a wave of destruction in its path. True to the pioneer spirit that created the area, the people of the Homestead/Florida City area picked up, rebuilt and restored. Hurricane Andrew was, at the time of its occurrence in August 1992, the most destructive hurricane in United States history. It caused major damage in the Bahamas and Louisiana, but the greatest impact was in South Florida, where it made landfall at Category 5 hurricane intensity on the Saffir–Simpson hurricane scale, with wind speeds up to 165 mph. Passing directly through the town of Homestead, Florida, a city south of Miami, Andrew obliterated entire blocks of homes, in many cases leaving only the concrete foundations. Over 25,000 houses were destroyed in Miami-Dade County alone, and nearly 100,000 more were severely damaged. 65 people were killed and the damage total across the affected regions exceeded $26 billion. Downtown Homestead now looks better than it ever did and is home to seven properties listed on the National Register of Historic Places, as well as unique shops, art galleries, authentic Mexican and specialty restaurants and the Homestead Antique Federation.